This research note is an effort to bring American public opinion to bear on this vital conversation. 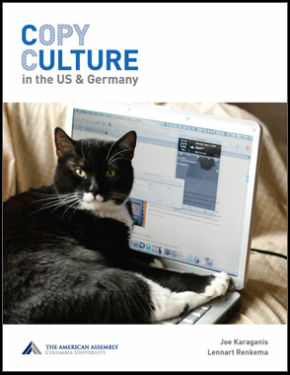 The note excerpts a forthcoming survey-based study called Copy Culture in the U.S. and Germany. Drawing on results from the U.S. portion of the survey, it explores what Americans do with digital media, what they want to do, and how they reconcile their attitudes and values with different policies and proposals to enforce copyright online. The Copy Culture survey was sponsored by The American Assembly, with support from a research award from Google. The content of the survey and its findings are solely the responsibility of the researchers. The U.S. survey was conducted by Princeton Survey Research Associates International. The results are based on interviews on landline and cellular telephones conducted in English with 2,303 adults age 18 or older living in the continental United States from August 1-31, 2011. For results based on the entire sample, the margin of error is plus or minus 2 percentage points. Full results and data will be available in early 2012. 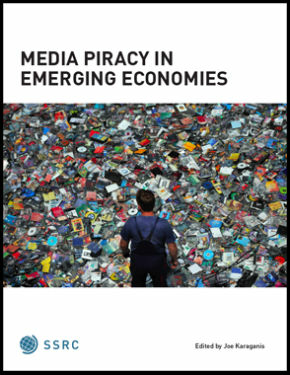 Large-scale digital piracy is rare, limited to 2% of adults for music (>1000 music files in collection and most or all copied or downloaded for free) and 1% for film (>100 files, most or all from copying or downloading). 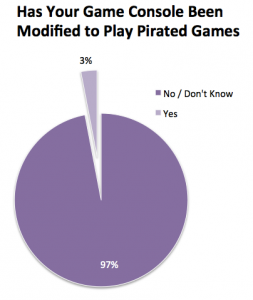 Console-based video game piracy is very rare, limited (on any scale) to 1-2% of the population. Legal media services can displace piracy. 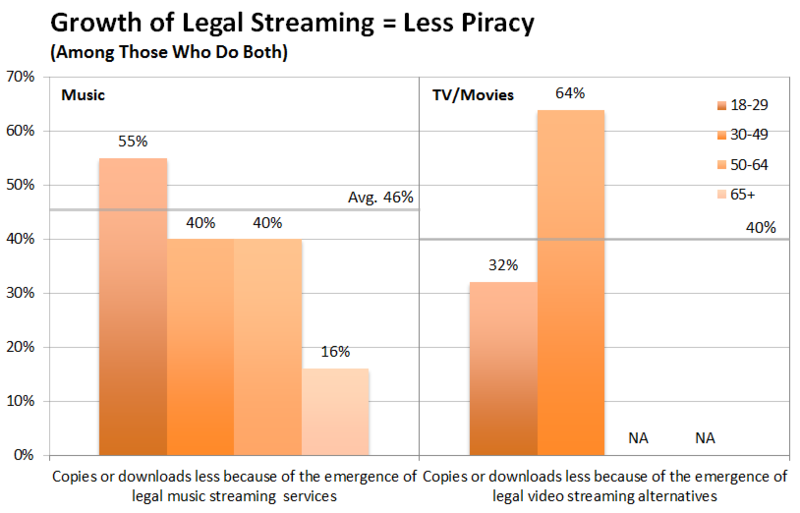 Of the 30% of Americans who have ‘pirated’ digital music files, 46% indicated that they now do so less because of the emergence of low-cost legal streaming services. Among TV/movie pirates, 40%. Among those who support fines, 75% support amounts under $100 per song or movie infringed—hugely undershooting the current statutory penalties. For a majority of Americans (54%), due process in such matters requires a court—not adjudication by private companies. Comparable majorities (56%) oppose government involvement in “blocking” access to infringing material. This number increases to 64% when the term “censor” is used. Blocking and filtering by commercial intermediaries such as ISPs, social media sites, and search engines receive majority support—until the questions include likely consequences. Majorities of Internet users support requirements that ISPs and search engines “block” infringing material (58% for ISPs; 53% for search engines). This support runs as high as 61% for a soft requirement that user-content driven sites like Facebook “try to screen all material and reject pirated copies of music and videos.” But this majority disappears when blocking by ISPs is characterized as censorship (46% support), falls further when associated with the blocking of legal content (36% support), and still further when it implies surveillance of Internet use (26% support). Which scenario best approximates the Stop Online Piracy Act? In our view, ISP blocking that also blocks some legal content. In this case, Internet users oppose blocking: 57% to 36%. “Piracy” is common. Roughly 46% of American adults have bought pirated DVDs, copied files or discs from friends or family, or downloaded music, TV shows or movies for free. * These practices correlate strongly with youth and moderately with higher incomes. Among those 18-29: 70% have done so. About 40% of American adults have copied CDs, music files, or downloaded music for free. 20% have done so for TV and movies. Gender doesn’t matter. In most questions related to copying, men outpoll women by 2% or less. Copying has a modest partisan divide: 24% of Republicans, 31% of independents and 35% of Democrats have copied or downloaded music for free. Large-scale digital piracy is rare. Roughly 2% of Americans are heavy music pirates (for our purposes, those who have collections of more than 1,000 files and who indicated that they downloaded or copied most or all of them.) Only 1% acquired these files primarily or exclusively through downloading. TV/movie piracy remains a marginal practice on any scale. Only 14% of Americans have any TV/movie files on a computer or other device. Only 22% of this group (3% overall) get most or all of these files from file sharing. Among 18-29 year olds, 7% do. 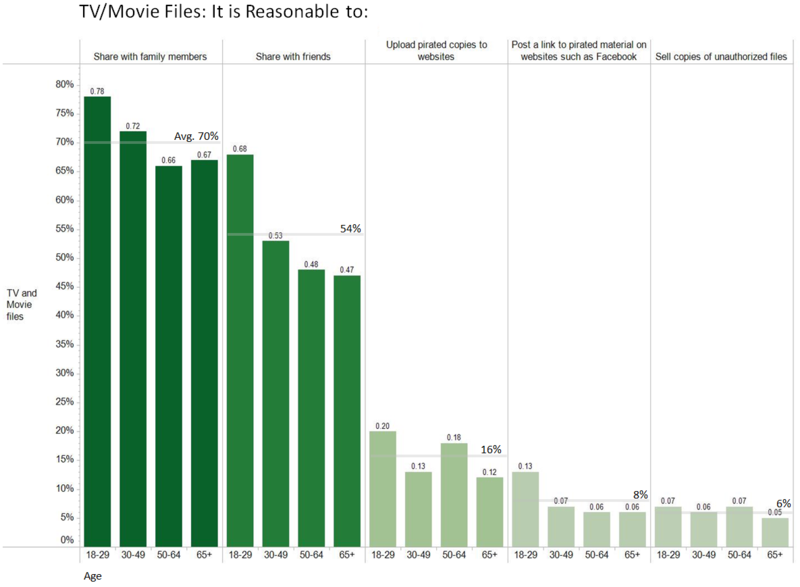 Only 2% of Americans possess more than 100 TV show or movie files. Among 18-29 year olds: 4% do. Only 3% of Americans possess very large digital music collections (over 5,000 music files). Among those 18-29, 7% do. Console-based video game piracy on any scale is rare. 48% of households surveyed owned game consoles (Xbox, Playstation). 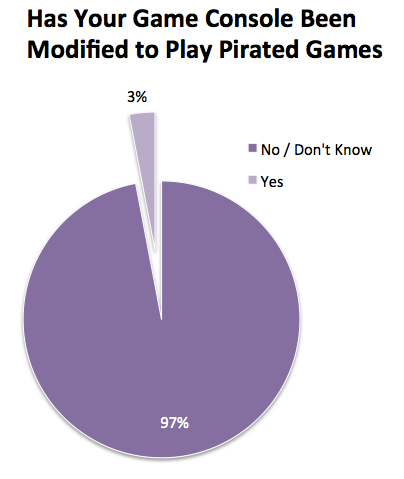 Of these, roughly 3% (1.5% overall) have consoles that have been modified to play pirated games. Of this 3%, 55% were modified at time of purchase and 33% by the owners. We did not inquire about PC or mobile games. Piracy and legal acquisition are complementary practices. Less than a third of those who “pirate” music and video (14% of Americans) said that they had copied or downloaded for free most or all of their collections. Among those 18-29, slightly over a third have done so (27%). Legal streaming services show signs of displacing some piracy. Of the 30% of Americans who have copied or downloaded digital music files for free, 46% indicated that they now do so less because of the emergence of these services. 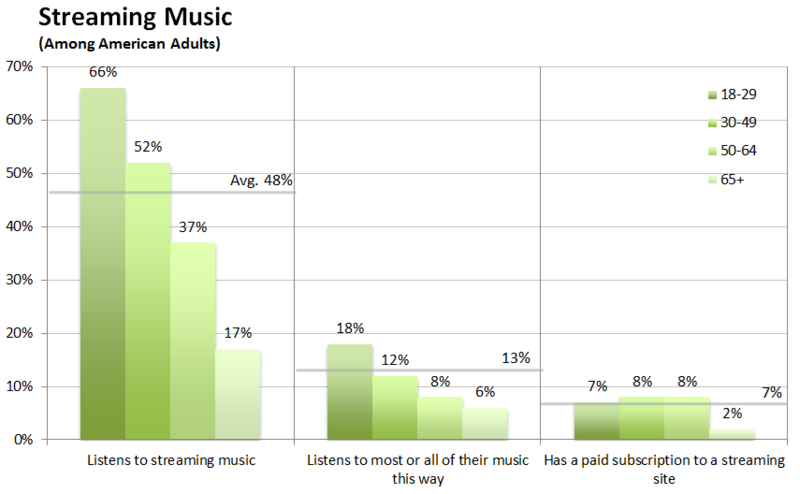 (The survey was conducted prior to the US launch of Spotify). The comparable figure for video–the so-called “Netflix effect”–is 40%. 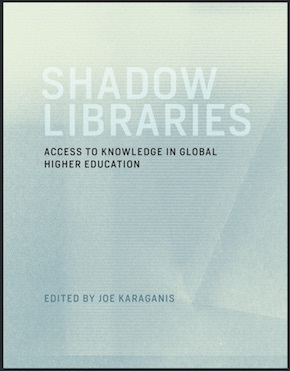 In contrast, dissemination of copyrighted goods through larger networks receives low levels of support. Very few think it is reasonable to upload copies to websites where anyone can download them (16%), post links to illegal copies on websites such as Facebook (8%) or sell illegal copies (6%). An expansive view of what’s reasonable correlates strongly with youth. ‘Share with Friends,’ in particular, is an elastic category that for many young people includes infringement over the Internet. What are Appropriate Penalties for Infringement? Only a slim majority of Americans (52%) say “people should face punishment if they download an unauthorized copy of a song or movie from a website or file-sharing service.” 34% are opposed to penalties altogether; 7% say it depends on the circumstances; 7% did not answer. This support is limited to warnings and fines. Among those who support penalties, the use of warnings (86%) and fines (87%) attracts high rates of approval. There is much less support, however, for imposing limitations on the speed or functionality of Internet service (47%), and little support for disconnecting users from the internet (26%). Jail time attracts support from 20% of this group—relevant because the (rarely-applied) criminal statute has a low threshold that encompasses consumer-level file sharing. Viewed in terms of the general population, support for specific penalties drops sharply. Among all Americans, there is only narrow majority support for warnings (51%) or fines (51%) of any kind. Support for limits on Internet speed or functionality falls to 28%. Disconnection, in particular, is very unpopular, with only 16% in favor and 72% of Americans opposed. Among that 16%, most (58%) would drop their support if it meant disconnecting households rather than individuals—which it does. Informed support for disconnection, accordingly, is under 10%. Further, among the 16% who say that disconnection is an appropriate penalty for downloading pirated songs or movies, 25% say that the disconnection period should be less than one month. An additional 34% say that the disconnection period should fall between a month and a year. 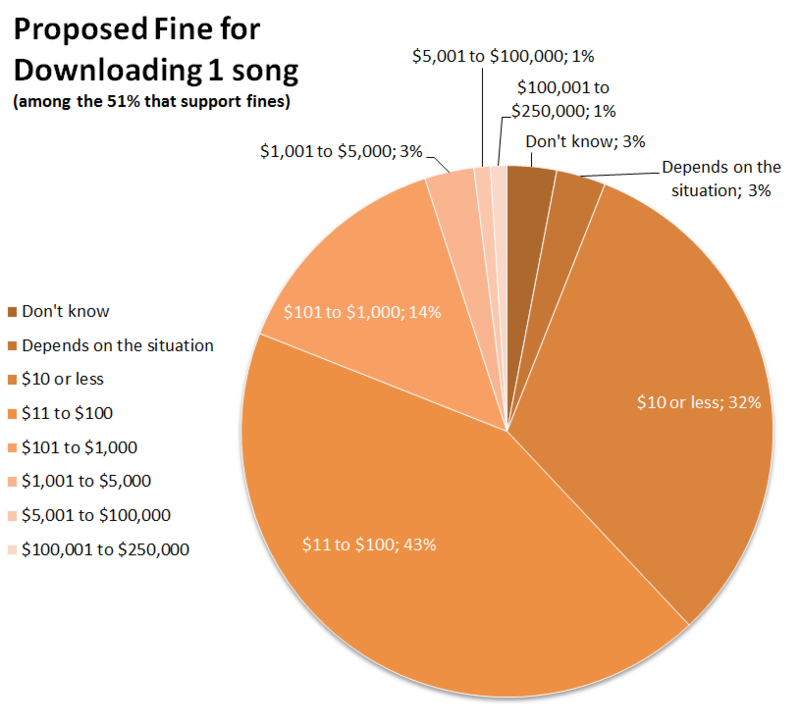 Even among those who support fines, 75% support amounts under $100 for downloading a song or movie. “Less than $10” attracted 32% support; “$11 to $100” attracted 43%. This contrasts sharply with U.S. copyright law, where the statutory penalty for willful infringement runs to $150,000 per act. Fines in this range were supported by less than 1% of Americans. The recent “six-strikes” agreement between U.S. music and film companies and ISPs to deter and punish infringers does not provide for judicial review. Should Intermediaries Block Infringing Material? ISPs, search engine, video hosting and social networking companies, cloud storage providers and other intermediaries have come under pressure to block copyright infringement that utilizes their networks and services. Because such proposals raise a mix of relatively new political and technical issues, public opinion on these matters is soft—highly susceptible to word choice and the way questions are framed. Accordingly, we tested responses to several functionally equivalent terms, including ‘screening’ ‘blocking,’ and ‘censoring’ infringing materials. We asked whether people support the monitoring of their Internet use—a precondition of most filtering measures—as well as their views toward the different organizations that would do the blocking. Because of the relatively high degree of Internet literacy required to address this set of questions, we posed them to home Internet users (72% of the population) or to all Internet users (79%). We believe that the results are reflective to a large degree of those of the wider population. American Internet users (79%) have strong views about whether corporations or the government should monitor their Internet use “in order to prevent copyright infringement.” A large majority (69%) said no. 27% responded yes or sometimes. 3% did not know. Attitudes are softer when asking whether ISPs should “block access to sites that provide access to pirated songs and videos.” A 58% majority responded yes to this question, with 36% opposed. When asked if the government should block access, that majority vanishes (40% yes; 56% no). When we use the stronger word “censor” for “block,” support drops significantly. When asked if ISPs should censor such sites, users are split: 46% say yes; 49% say no. When asked if the government should censor those sites, the results are strongly negative: 33% say yes; 64% say no. What about search engines? 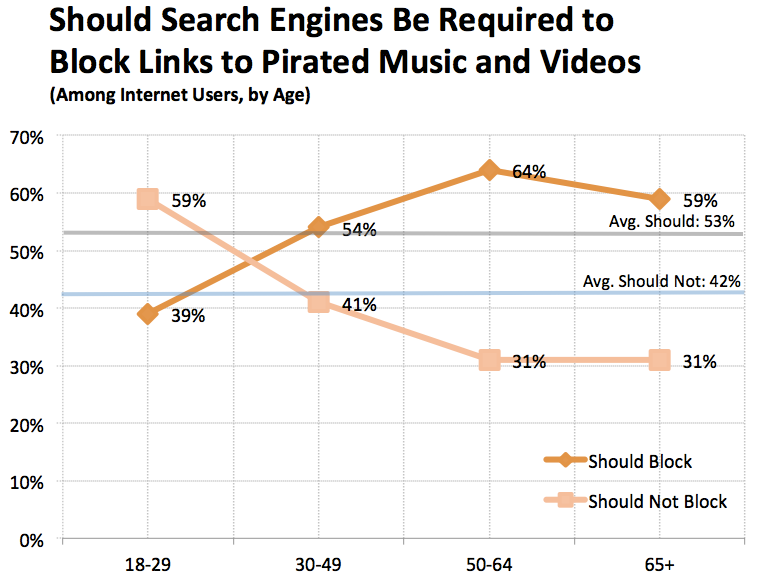 Should they “be required to block links to pirated music and videos online?” Based on all American Internet users, 53% favor such a requirement while 42% are opposed. Here, views correlate strongly with age: only 39% of 18-29 year olds support such a requirement while 59% oppose it). Those 65 and older supported it by 59% to 31%. What about websites such as Facebook, Dropbox and others that allow links or files to be uploaded by users? Here, we tested softer language that asked whether such sites should “try to screen all material and try to reject pirated music and video?” 61% said yes; 32% no. What if efforts to block infringing files and links to infringing content also result in the blocking of some legal content (as has been the case with all large-scale efforts to filter content to date)? In this case, support for blocking infringing materials drops sharply. Overall, 57% oppose blocking in this case; 36% support it. 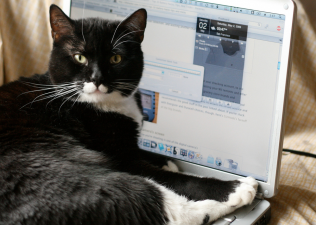 About 18% of Internet users deliberately encrypt their Internet traffic. About 4% use IP-masking tools such as TOR. This is the leading edge of a privacy vs. surveillance arms race. Solid majorities of Americans Internet users oppose copyright enforcement when it is perceived to intrude on personal rights and freedoms. 69% oppose monitoring of their Internet activity for the purposes of enforcement. 57% oppose blocking or filtering if those measures also block some legal content or activity. Comparable majorities (56%) oppose government involvement in “blocking” access to infringing material. This number increases to 64% when the term “censor” is used. Government intervention in this area is unpopular. Results are much more volatile for commercial intermediaries such as ISPs, social media sites, and search engines. 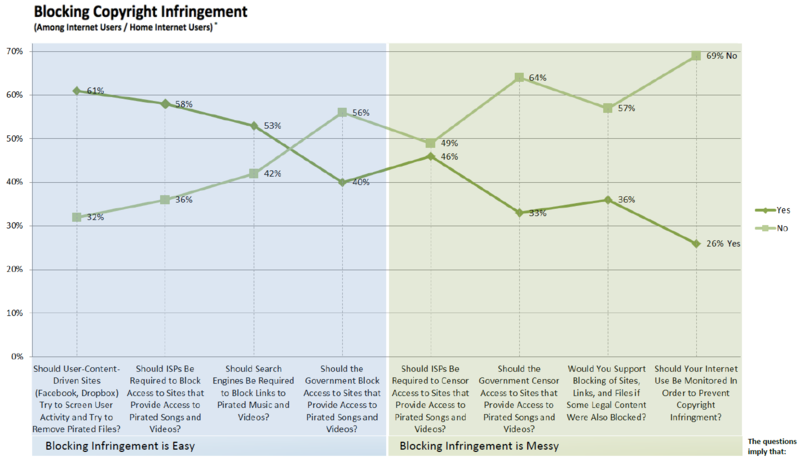 A majority of American internet users supports requirements that ISPs and search engines “block” infringing material (58% for ISPs; 53% for search engines). This support runs as high as 61% for a soft requirement that user-content-driven sites like Facebook “try to screen all material and reject pirated copies of music and videos.” But that majority disappears when blocking by ISPs is characterized as censorship (46% support) and falls further when associated with the blocking of legal content or activity (36% support). The favorable (61%) response to whether social media and cloud storage sites should “try to screen” and remove infringing content is counterbalanced by the 69% opposed to monitoring for the purpose of preventing copyright infringement. Since screening requires monitoring in such contexts, these responses can be read as reflecting a low information / high information divide. What explains these differences? We think they track underlying assumptions in the questions. Questions that imply that blocking infringing material is practical and easy return relatively positive results. Questions that imply that blocking or screening is messy—i.e. likely to sweep in (“censor”) legal content or require surveillance of users—generate strong opposition. Given the controversial history of efforts to blacklist infringing sites and automatically discriminate infringing from non-infringing content, we view the latter assumption as much more realistic. * Piracy has no clear definition and involves a difficult set of practices to survey. Our composite definition likely captures some non-infringing downloading as well as underreporting of copying. We treat these as minimal and countervailing. ** These questions are based either on all Internet users (79% of all adults) or on home Internet users (72% of adults). For those questions based on all internet users, the results were not significantly different when the base of respondents was limited to home internet users. 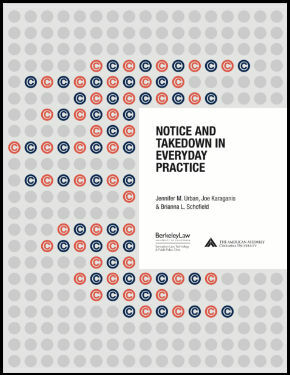 Pingback: Study: Piracy is accepted practice in U.S., but casually | howtow | How to What?